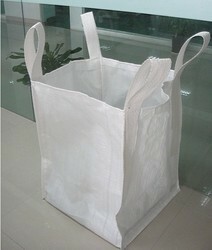 Providing you the best range of jumbo bags with effective & timely delivery. With possibility of customization so as to suit the individual packaging requirements, our expertise also lies in meeting the demands of Jumbo Bags that function as flexible intermediate bulk containers. Jumbo Bags offered by us are flexible intermediate bulk containers that are custom tailored so as to suit the individual requirements. These are used for carrying bulk cargo in single package option. Its precise design and construction, also make these suited for a wide range of end products like Soda Ash, Dyes, Cement, Chemicals and others.